The 1973/74 side are presented with a special gift to mark their achievement. Coleraine Football Club celebrated its 90th anniversary in style on Saturday with a host of club legends there to celebrate this special occasion. The title-winning side of 1973/74 were the guests of honour, and Northern Ireland legend Jimmy Nicholl kept the massive crowd entertained as guest speaker. Current Club Chairman, Colin McKendry welcomed everyone to the Lodge Hotel for this proud moment in the club’s history. “It is my privilege to stand here as club chairman, a club I have supported since I was a boy and to be able to welcome you all here tonight on behalf of the club is a very proud moment for me and my family. “This club has a very, very proud history and a lot of the history makers are in the room tonight, hopefully along with others who will add to our history in the very near future. “We especially welcome the players from the 1973/74 season, our only league winning team. “There are a couple of other gentlemen who have had a long association with this club, namely Mr Harry Gregg and Mr Victor Hunter. “Through the Harry Gregg Foundation, set up in line with our club academy, Harry and Victor can both be seen running their eye over the next generation of talent at the Small Sided Games Centre. “I would like to thank the club sponsors Eventsec and G&H Film and Television Services for all their support, and all the sponsors involved tonight. “I would also like to thank all our club volunteers who work tirelessly behind the scenes. “And also all our Supporters’ Clubs and our club owners the Friends of Coleraine FC, who annually contribute financial help to our club. “To all the members of Friends I thank you all, because without your help we would find it very difficult to finance our club. The club used the occasion to recognise two very important men who helped shaped the future of the Bannsiders - Bertie Peacock and Victor Hunter. Bertie’s grandson Ron was presented with a special gift to recognise the role Bertie played in making the club a force in local football and leading them to their only League title in 1974. Victor Hunter, who spent the majority of his life at The Showgrounds as a player, coach and manager was made Honorary Life Vice-President. “It’s not often I’m stuck for words, but I can tell you tonight really appreciate this,” said Victor. His son Barry, who came through the ranks at Coleraine before going on to play in England was also there on the night. “Coleraine is my club I grew up around it, seeing all these players tonight they were my heroes,” he said. “I could name my all-time favourite team. Another former Bannsider, Steve Lomas, also praised the current crop of players. “The 1974 team wasn’t just a great team, but they had great camaraderie. Skip forward to the current team they played brilliantly against Ballymena, but you could also see the camaraderie and togetherness they have,” he said. “If they are to go on and win the league they need a bit of luck with injuries, but also the fight and camaraderie to stick together. “I wish Colin and Oran and all the boys all the best. Current NI boss Michael O’Neill, who played for Coleraine in the 1980s sent a specially recorded message. He said: “I’m sorry I’m not able to join you all tonight to celebrate Coleraine Football Club’s 90th anniversary. “I had a great time there as a young player developing under the likes of Jim Platt, Bertie Peacock, Drew Cook and Victor Hunter, and it will always have a special place in my heart. Former Manager Jim Platt also passed on his best wishes. 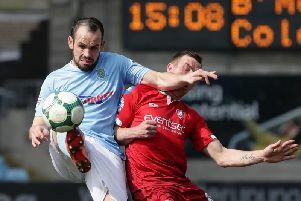 “Coleraine Football Club had many great players down the years and a lot of internationals, who could forget Victor Hunter starring at Wembley,” he said. Lonf time fan and current club sponsor Jimmy Nesbitt was unable to attend because of filming commitments, but he sent a special message. He said: “It’s an important week for anniversaries, not only are Coleraine FC celebrating but also my father, for whom Coleraine is such a major part of his life and I’d like to thank everyone at the club for the way they look after him, he was 89 on Thursday. “And I believe my first Coleraine hero Dessie Dickson is 70 next week. All the players there tonight, past and present, are heroes of mine. “To support Coleraine for the last 42 years has been one of the great privileges of my life, and to now be a sponsor alongside Maurice Brown is truly one of the great joys. Another former manager, Kenny Shiels made a special presentation to the club. “My father Roy was a massive Coleraine fan and he used to bring me to the games. “He was the Chairman of the Maghera Coleraine FC Supporters’ Club. During the years they collected club dues, but sadly everyone associated with the club has now passed away, including my father.